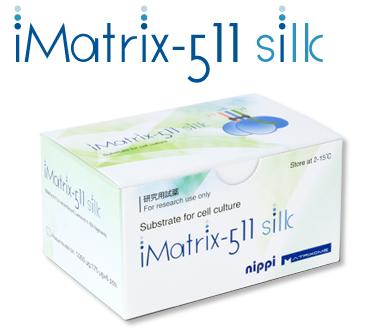 “iMatrix-511” and “iMatrix-511 silk” are recombinant human laminin-511 E8 fragment for cell culture. Below are the features possible of laminin-511 E8 fragment on ES/iPS cells and mesenchymal stem cells (MSC). 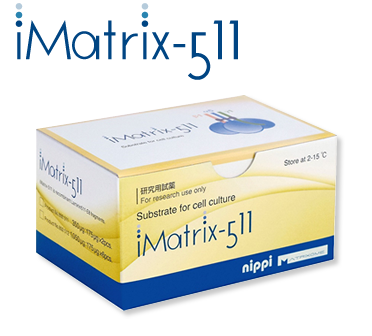 Characteristics: iMatrix-511 is a highly pure and refined product of Laminin-511 E8 fragment developed by incorporating genes of human Laminin-511 E8 domains into CHO-S cells. Characteristics: This is a highly pure and refined product of Laminin-511 E8 fragment extracted and refined from a silkworm cocoon in which genes of human Laminin-511 E8 domains have been incorporated.